Mary Bunker first came to Music Hall in 1985, when she and her second grade class traveled to Cincinnati on a field trip to hear a children’s concert. Three decades later, Mary and her husband Alan moved downtown. Not too long after their move, but before Music Hall’s renovation, they took a tour of the historic structure. It was then that Mary fell in love with the Washington Park/Over-The-Rhine/Music Hall/Arts area. 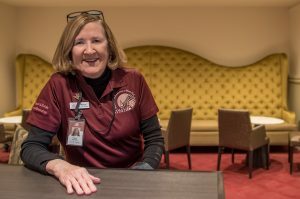 Mary volunteers for SPMH, giving Backstage and Beyond Inside tours. She loves sharing the history of Music Hall with visitors, particularly Springer Auditorium, her favorite place in Music Hall. Being with her family is first and foremost in Mary’s life. Otherwise she keeps a full schedule with volunteering. In addition to leading SPMH tours and meeting with Music Hall visitors at Guest Information, Mary volunteers at the Visitor Center on Fountain Square. Mary also lends her time and talent to The Children’s Theatre, the School for Creative and Performing Arts, the Cincinnati Symphony and The Otto M. Budig Shakespeare Theatre. I feel like a kid in a candy store living in downtown Cincinnati. I love the renaissance happening in the city right now. Whether it’s seeing a performance at SCPA or volunteering for the wonderful art venues, it keeps me thinking and feeling young.